Central Question: What can the noir novel teach Hollywood—and the rest of us—about the value of dreams? It was that dream again—always the same dream. This opener might feel familiar; once you start looking, it’s everywhere. If not increasing in frequency, the recurring dream as literary trope has lately gained a certain prominence of placement: “Always the same dream,” reports the narrator in paragraph two of Nathan Larson’s post-apocalyptic detective novel, The Dewey Decimal System; “Always the same dream,” echoes the first line of Vladimir Sorokin’s post-Soviet dystopia, Day of the Oprichnik; “These were the same dreams he’d been having for years,” begins part two of Zone One, Colson Whitehead’s take on the urban zombie wasteland. And so on. Dream interpretation and detective noir are familiar bedfellows. The connection may even be a commonplace: the crime as a patient’s suppressed primal trauma, the detective as analyst. Even so, why the primacy, and the psychological obtuseness, of the recurring dream as a means to convey psychological information about these stories’ otherwise nonemotive antiheroes? We might round up the usual suspect: Hollywood. The genres of film most closely related to the above books—sci-fi, fantasy, mystery thriller—have long used the device as shorthand for psychic scene-painting (Jonathan Pryce’s steel-winged fantasias in Brazil), amnesia-obscured backstory (Harrison Ford’s flashbacks to his wife’s murder in The Fugitive), or foreshadowing (Bruce Willis’s premonitions of death in Twelve Monkeys). In these films, the dream’s repetition renders it significant; it becomes a pattern for the viewer to follow, demanding interpretive work, much as the repeated word in a poem accrues retroactive significance. Yet such dreams often fail to compel, on the screen or on the page. “That’s not how it is at all!” we want to shout, as we storm out of the theater or throw the book across the room. Dreams in real life aren’t like crossword puzzles, with rationally decodable clues, or—worse—like mere waking memories. It’s refreshing, then, to read a contemporary American novel that gets this. 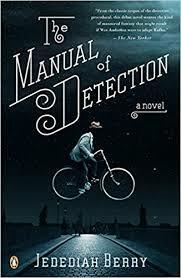 In The Manual of Detection, Jedediah Berry finds a clever, reflexive extreme for the film-inspired confluence of dreams and detection, all while gently skewering the familiar gangsters, femmes fatales, and acerbic dicks of Chandler or Hammett. In Manual, no gumshoe foregoes his trench coat, no snitch fails to double-cross, no dialogue goes un-pulped. (“I had her all wrong,” Berry’s detective admits of an inscrutable dame every time she revises her allegiances—four or five times over the course of the book.) And, significantly, not only are recurring dreams present from the first page, but dreamwork is as much a part of the detective’s arsenal as the magnifying glass or pocketed gun. there were two cities. One consisted of the seven blocks between his apartment and the Agency office building. The other was larger, vaguer, and more dangerous, and it intruded upon his imagination only by way of case reports and the occasional uneasy dream. This metaphor becomes literal when Unwin discovers a secret class of oneiric detectives: men who solve crimes by surveilling recordings of the civilian population’s dreams. These dreams, preserved on LPs in the detective agency’s underground archives, occupy a shared landscape that resembles, to trained detectives, a negative print of the waking city. When Unwin’s detective disappears on a major case, the reluctantly promoted clerk must learn to navigate this dream landscape in order to find his boss and, in the process, uncover the agency’s murky origins. As surreal dialogue and temporal confusion emerge as features of the waking city itself, not just of its somnolent citizens’ shared recurring dreams, the status of Unwin’s (un)consciousness becomes increasingly ambiguous. To his credit, Berry refuses to use the dreamscape for load-bearing functions like foreshadowing or backstory; rather, dreams intrude into the waking plot, effacing the boundary between the “fictional dream” and dreams-within-fictions. Indeed, in Manual, to paraphrase the tagline of Inception, that more recent and altogether disappointing cinematic dreamscape, the citywide dream is the scene of the crime. Berry thus gets us much closer than Hollywood does to a properly Freudian understanding of dreams: as communiqués from the unconscious, written in an unfamiliar but nevertheless intrusive, traumatic language. As a result, despite the deceptive flatness of its characters, Manual is more psychologically interesting than those works that assume a superficial connection between dreams and detection. That connection obviously exists—we intuitively feel the dreaminess of hardboilers like Chinatown, and of writers like Borges, Ishiguro, and Auster—but Berry investigates it explicitly by asking just what the surreal dreamscape and the noir cityscape share. Why does the recurring dreamer return to the dream, the detective to her case file, the criminal to his crime scene? What drives us to force a kind of logic onto dreams, as though their meaning—or culprit—could be made available to us with the correct interpretation of clues? And how do we distinguish between clue and mere oneiric detail? Berry navigates this gap with a nuanced understanding of how it informs the detective’s eternal concern: the search for causality in what may be a meaningless world.